In case you missed it, The Appademic has a full year’s subscription for Setapp to give away. If you don’t know what Setapp is, it’s like a curated App Store. You pay a small subscription fee and you get access to everything. No in-app purchases, no advertisements, and every upgrade. There are currently one hundred carefully chosen macOS apps, with more on the way. While this is an important development for all kinds of Mac users, Setapp have taken a keen interest in academics. More study tips are turning up on their blog all the time. t makes sense. I’ve pointed out how useful their service could be to students, or anyone doing academic work. Moreover, anyone affiliated with an education institution can have ongoing access to Setapp for $5 a month. The suite includes writing apps like Ulysses, and Manuscripts. Mind mapping tools like iThoughtsX and XMind. It has one of the best task managers going around in 2Do. There are project planners in Merlin, and Aeon Timeline. Findings, the lab notebook. The Studies app. The automated time tracker, Timing. 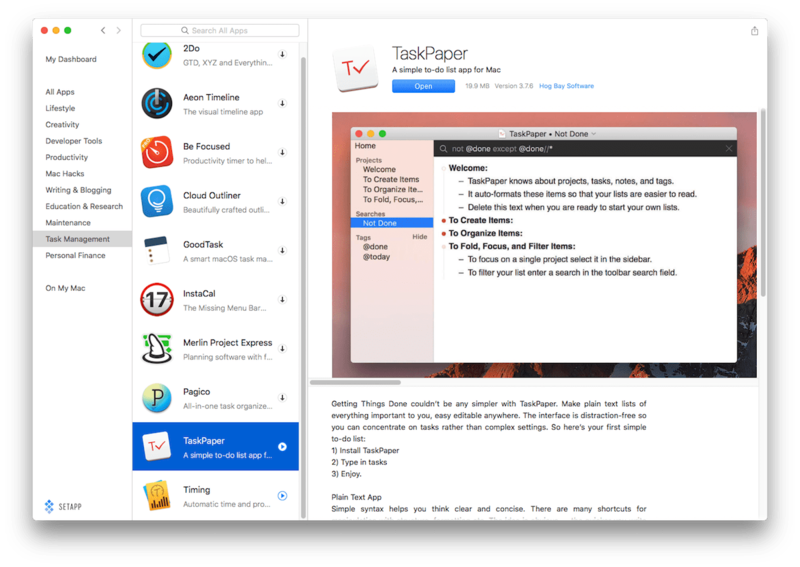 Clever plain text outliner and to-do list app, Task Paper is there. Even Brett Terpstra’s brilliant text utility, Marked. The list goes on. It even includes the cross platform digital audio workstation, n-Track Studio. If I were a more dedicated budgeter, I would do the math on all this properly. Maybe I will. I haven’t done it to date, as I have a pretty strong inclination it wouldn’t be a close race. A Ulysses subscription alone would eat up most, if not all the budget. Not only is Setapp a really good idea, it’s a bloody good deal. Lucky for you, I still have a year’s subscription up for grabs. If you want a chance to go in the draw, you have a few options. Sign up for to the mailing list and you’re in. If you want to enter twice, you can by doing both. Don’t worry, I have neither the inclination, nor the resources to spam you. The newsletter will be monthly at most — for the time being at least. The first one is already late. You can opt out at any time. And I would rather scratch my own eyes out than sell anybody’s data for any reason. And, I hardly use twitter, it's not really my jam. The idea is simply to get the word out that this place exists. Sharing is the easiest thing you can do to support this site at this point in time. By sharing, you will contribute to keeping the lights on at The Appademic by helping it grow. Thank you for that. This will run until the 8th of December, no matter where in the world you are. As long as you enter by then, you’re a good chance. The winner will be notified on Monday 11th December.